Why is periodic recaulking extremely important? A very important, but often neglected area in your showers, bathtubs, sinks, countertops, and backsplashes, is your caulk. When water or moisture is left to dwell on your caulk and grout, mildew can begin to appear. Making sure all of your joints and gaps are sealed with our caulking helps control water penetration and unhealthy mold growth. Caulking issues should be taken care of to avoid extensive damage to your home. Thankfully Groutsmith recaulking services specializes in professionally removing your old, worn caulking and replacing it with our color-matched caulking. If you are worried that your caulking needs to be replaced you can contact Groutsmith in Temecula Valley and we will prioritize an inspection on your grout and caulk work. 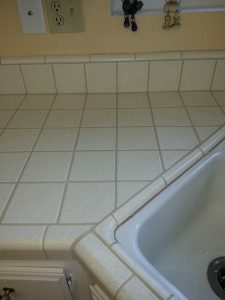 It is advisable to be regularly replacing caulk and carefully recaulk the joints between tiling and bathroom fixtures because occasionally black mold can grow in these areas causing serious health problems. If your current caulk appears worn and discolored, it might be a good idea to get your caulk inspected to make sure that the damage has not already been done. Groutsmith Technicians specialize in dealing with Caulking issues. Contact us now for a free assessment.